Compared to some countries, the UK does not utilize a great deal of stop signs and instead the give way sign is most frequently used. Both the give way and stop sign are regulatory signs, meaning that they are giving an order. The difference between give way and stop sign other than the shape, is the text telling you what must be done. A give way sign tells you that you must give way to traffic ahead and a stop sign tells you that you must stop. Do you have to stop at a stop sign? The simple answer is yes! Stop signs are often located at hazardous junctions. There are open and closed junctions – open being the type of T-junction that is easily determined whether it is safe to proceed without the need to stop as a clear view of the road that you are entering is available. A closed junction makes the road you intend on joining obscured by trees, fences hedges etc. See junctions for a further in-depth explanation. 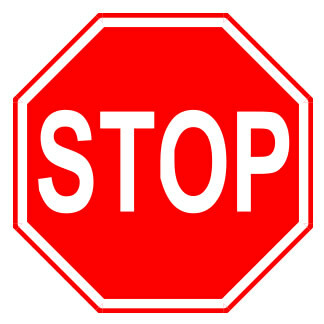 A stop sign may be located at a closed junction or a junction that is particularly hazardous for any reason. They may also be placed in areas of high accident rates. Give way signs may also be used at hazardous junctions, but unlike stop signs it is the driver’s discretion whether they stop or not. In terms of the Highway Code, the words ‘must‘ and ‘should‘ are often used. The word ‘should’ is advisory and the word ‘must’ is used when giving an instruction of a rule or law (regulative). Motorists must stop behind the line at a junction where a stop sign is in place with a solid white line. It is law that a driver must stop at least once before the line and wait for a safe gap before proceeding. The Highway Code states to cyclists ‘You MUST obey all traffic signs and traffic light signals’. Like motorists, cyclists must also stop at stop signs. The penalty code TS30 – Failing to comply with stop sign, will gain three penalty points on a drivers licence which will remain in place for four years. Running a stop sign will usually see drivers faced with a £100 fixed penalty fine, though in more extreme cases, fines can amount from between £100 to £1000. When approaching a stop sign during driving lessons or a driving test, they must be approached using the exact same Mirror Signal Manoeuvre (MSM) or MSPSL routine as any other junction, regardless of whether it has a give way or stop sign. Unlike a give way sign however, regardless of whether it appears safe to proceed without the need to stop, you must stop just before the solid stop line. If you fail to stop, if you stop on the line or slightly after, you will fail the driving test. Even though you must stop just before the stop line, assess the junction as you approach to establish what you are dealing with and how open, closed and hazardous the junction appears. 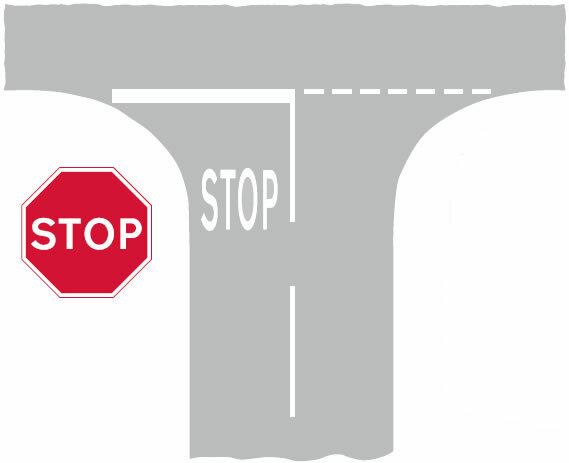 The junction may be difficult to see if it is clear to proceed out of and in such cases you may need to use the creep and peep technique. This will involve moving forward extremely slowly using clutch control whilst quickly observing up and down the road. Be prepared to stop again if necessary even if you have crossed the stop line.